Much of the intrigue surrounding any new draft class revolves around the mystery of how good the players will turn out to be. The Eagles seem very high on Jordan Matthews, and GJ Kinne has told us he’s special. Recently, Tommy Lawlor and Brent Cohen both speculated about what type of impact he’ll have in his first year, so I became very curious about what expectations for Matthews are reasonable. Last year, Noah Becker was very good about tempering expectations for Zach Ertz, so ignoring the hype, what should we expect from Matthews in Year 1? 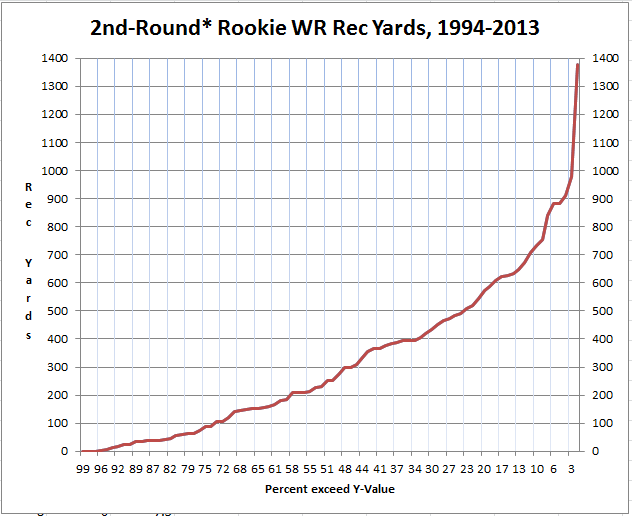 Below is a graph of all 2nd-round1 rookie receiver outputs from 1994-20132 (80 players). The Y-axis shows yardage, and the X-axis3 tells us what percentage of the sample exceeded that output. So, roughly 33% of rookie 2nd-round receivers exceed 400 yards. So, what are your expectations for Matthews in his rookie campaign? Follow this blog on Twitter (really good idea). 1. In-depth Carey Spear Breakdown: Can he kick Alex Henery out of town? 1- I defined 2nd round as picks 33-64. P-F-R’s Player Season finder was being glitchy and this search seemed to work better. I still actually had to filter out a bunch of undrafted guys that somehow ended up in the results. Here‘s the query I used. 2 – I chose this range to balance wanting a big sample with wanting to minimize the effect of relatively less potent passing offenses from earlier years. Ideally, I’d adjust the stats, similar to what Chase Stuart did here. 3 – Yes, I considered flipping the axes, but Excel was being goofy about that so I just left it. Ugh, Reggie Brown had a decent rookie year, he just never managed to move past that. If Mathews can’t beat out Brown’s rookie output, I’ll be disappointed. Since passing yards have gone up a lot since the beginning of the period, one should expect a higher output than the average mentioned above, all things being equal. An interesting tweak here would be to take the output of all the receivers and adjust the yardage upward of 2nd round receivers to the “2013 equivalent” by either differential versus average receiver or passing yards per team.